Hello, my name is Harlow. I am an alcoholic. 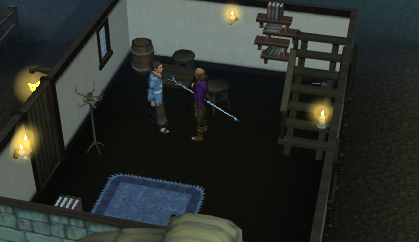 Begin by speaking to Morgan in Draynor Village. You can begin the quest by speaking to Morgan, whose house is southwest of the wheatfield. He will tell you the town of Draynor is plagued by Count Draynor, a "vampyre" (apparently the education system in Draynor is not great). He will ask you if you could help and you should accept the quest. He will ask you to visit his old buddy Harlow, who is an expert vampyre slayer but a bit past his prime. He will also tell you he can be found in the Blue Moon Inn. Before leaving, however, head upstairs and search the drawers for some garlic. You will need garlic later in the quest. If you cannot find it here, search around elsewhere or go to the food shop in Port Sarim and buy some there. Once you have the garlic, start heading over to Varrock. Go into Varrock and you should find the Blue Moon Inn across the street from the sword shop, as seen above. When you get there, speak to Harlow. You should soon figure out why he is past his prime. 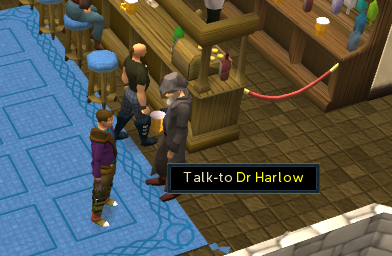 Speak to Harlow and he will ask you to buy him a beer. Now speak to the bartender and buy a glass of the "finest ale" for two coins. Bring the beer to Harlow and he will tell you about vampyre slaying. He will give you a stake and stake hammer and tell you there is a chance of death (Harlow does not realize you are using this guide). Now get ready for a fight and head back to Draynor. For the final showdown, you're going to need several things. Most importantly you will need garlic, a stake, and a stake hammer. If you have lost the stake or stake hammer you can go back to Harlow and he will give you them. If you have lost the garlic, you can rummage around Morgan's house and look for some or buy a clove from the Port Sarim food shop. Now onto the battle plan. 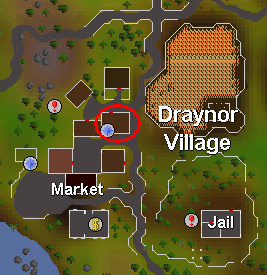 You should avoid ranging Count Draynor because Draynor is a melee monster and that would give him the advantage given the combat triangle. If you are a decent warrior and have no problem dealing with a level 40 monster, then skip this section and kill the guy. Otherwise, it is suggested that you attack with magic even if you have a magic level of one. Killing Draynor with any magic level is very feasible. You should try to bring some sort of elemental staff so you can save runes. If you don't have one already, you can get a tower mindspike by going through a small portion of the Rune Mysteries quest. The tower mindspike acts as an elemental staff that can be changed to any element. If you use air spells and an air elemental staff or equivalent, you will not have to use runes at all and should get by even if you are using air strike. Even though you may be able to get by without food you should still bring some because it's not worth taking the risk. 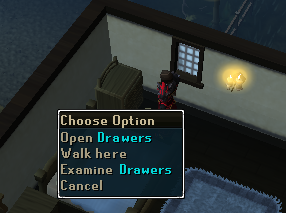 Head to the Draynor Manor and head through the front door, even with the warning. The manor is a little spooky, so don't get intimidated. Immediately after you walk in open the door on your right and head down the stairs. Walk towards the end of the basement and open the coffin. 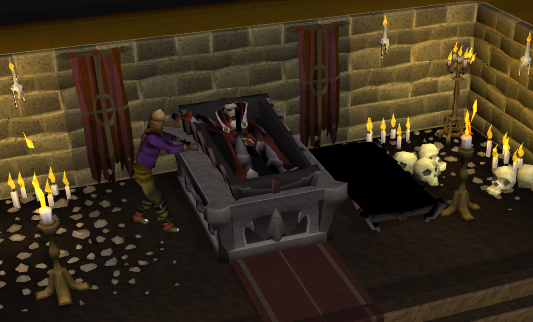 Your character will open the coffin and stab Draynor, awaking him from his peaceful rest. Then, he will teleport to near the staircase and begin battle. Draynor is a level 40 melee monster with a weakness to fire spells. It may seem that Draynor has got his game down with the fancy teleport move, but (besides garlic of course) he's got one major weakness: he's afraid of his own coffin. 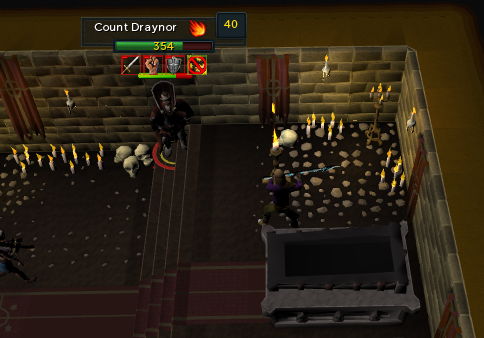 Run to the area where you opened the coffin (where the character is standing in the above picture) and Draynor should stop attacking you. Now let loose with your spells and abilities. You should be able to get a hit or two in before Draynor starts after you again. Once he begins to chase after you again, head back a few squares north and repeat the cycle. Even though this is a pretty easy way to kill Draynor, Draynor can pack a punch to low levels. He can hit well over 100, so keep your hitpoints high to prevent execution malfunctions. If at any time you think you need to get out of the fight, you can either run to the stairs on the other side of the room and exit or you can home teleport away from the spot where Draynor won't attack you. When Draynor gets to 0 health it is time to go in for the kill. Use the stake hammer on Draynor and your character will finish him off. Draynor will crumple and turn to stone. Now head back to Morgan by using the Draynor lodestone teleport or by walking. It is strongly suggested you use a lodestone teleport because getting out of the manor is a bit tricky. 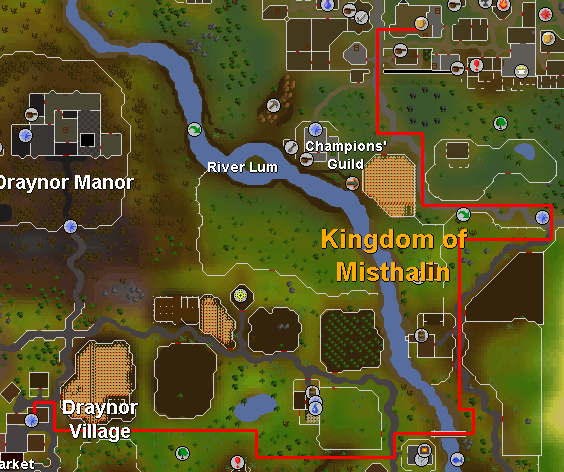 If you want to walk out, consult the Draynor Manor guide for help exiting. Tell him you killed the vampyre and he will take your word for it. (A bit odd. Maybe he is Canadian?) 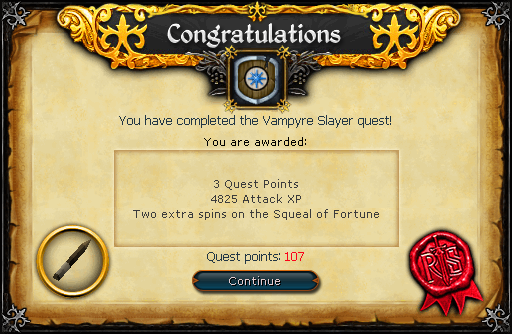 Anyway, Congratulations, Quest Complete!